My Property & Neighbourhood / Animals & Pets / Where is your cat now? 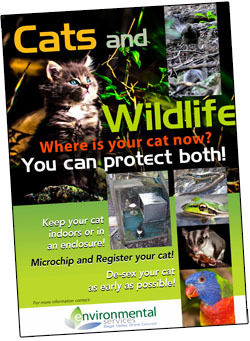 Under the NSW Companion Animals Act 1998 cats must be micro-chipped and registered. Keeping registration details up-to-date is important in case your cat is ever lost as it enables you to be reunited with your cat. You may also wish to put a collar and tag on your cat so it is obvious that the cat is an owned cat. Council’s rangers will always endeavour to return lost companion animals to their owners. Although the NSW Companion Animals Act 1998 does not specify if cats are to be kept indoors at night Council recommends that to protect your cat and the local wildlife that cats be kept indoors or in a cat enclosure. Council recommends that cats should be securely enclosed from dusk to dawn as this is the time wildlife is most at risk from cats hunting, and when cats are most at risk from injury and death from cars and fights with other cats. Enclosing them at all times provides absolute protection and ensures the safety of wildlife. The installation of cat-proof fencing or a cat enclosure is also a great way to better care for your cat. Information about building cat proof fencing and cat enclosures can be obtained by contacting Council’s Ranger Team on 6499 2222.